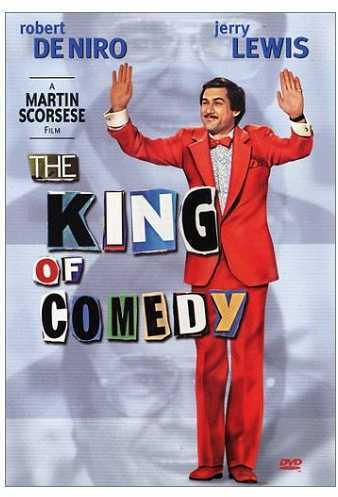 At the risk of attracting Scorcese-mad fanboys might I state that if The King of Comedy was made by a no-name director there is no way in hell anyone would be talking about it now, let alone labeling it Scorcese’s underrated masterpiece. In fact even De Niro thought there was room for improvement when he made basically the same film over a decade later in The Fan – which by the way is also boring and awful. Jerry Langford (Jerry Lewis) is less an 80s version of Jay Leno or Conan O’Brien than a variety show host version of Michael Jordan, Tiger Woods and Justin Bieber rolled into one. He is the best. Streets ahead of anyone else in the game and universally adored by one and all, unable to walk the street without constantly being delayed by admirers and autograph hounds, and after taping his show he must pass through a sweaty feverish throng of well-wishers and overzealous fans. It is during this running of the gauntlet one evening that Langford meets Rupert Pupkin (Robert De Niro) – whether he wants to or not. Pupkin squirms his way into Langford’s limo after a stroke of luck and against his better judgment – or perhaps to avoid further argument Jerry allows Pupkin to ride along for the short journey to his hotel. It is during the trip that Pupkin informs Jerry that he of course admires him greatly, but that further to this he sees himself as someone that could suit the show as a guest. It turns out that Pupkin is immensely confident of his stand up abilities, so Jerry ultimately decides to agree to listen to his stuff and will consider him for the show as long as he can provide a tape of his work. All good so far right. But as we learn quite rapidly Rupert Pupkin is not some talented no-name trying to fast track his way to the top, but a largely talent free never-will-be with incredible delusions of grandeur, delusions that manifest in the basement of the home he shares with his Mother where he runs his own variety show – complete with laugh track – and interviews the same cardboard cut-outs of real celebrities every night, while Mum continually yells at him to keep the noise down. The following days see Rupert continuing to role play while he waits for news from Jerry and the production company staff. When this is not forthcoming Rupert visits the company offices. Frequently. Of course Jerry doesn’t come out to meet with him personally, so to Rupert’s surprise he is left dealing with what he views as ‘underlings’, he decides that this breakdown in communication will be best solved by going direct to Jerry himself. While Rupert’s view of his own abilities and reality are poles apart, he still manages to talk a good game, so much so that he convinces a dubious barmaid to accompany him to a ‘meeting’ with Jerry one evening. A meeting that does not go well. Up to this point I was less than overwhelmed by events as they unfolded. Rupert’s bizarre self confidence even in the face of an obvious lack of true capability was more embarrassing than fascinating, which is why the awful acts on American Idol are the ones they replay 37 times per season. The train wrecks are always infinitely more memorable than the actual talents. But does that provide a lick of entertainment? Perhaps in another film but not here. Not The King of Comedy. I found the finale contrived and extremely unlikely. After all can you imagine how hard it would be to meet Michael Jordan or Tiger Woods, let alone have enough time to take things further… I mean unless you were a cocktail waitress or a cheap floosie that is. Bad example. While I yield the point that The King of Comedy is indeed a disturbing tale of what some ordinary citizens will do to share a moment in the spotlight, I can’t say it is a great one. In fact I don’t care how you spin it, who stars in it and who made it. The King of Comedy is the epitome of ‘just a movie’. Final Rating – 6 / 10. Now that I have the Scorcese-freaks riled up, might I add that I found De Niro’s performance a little TOO over the top?